In India, the vegetable leftovers from the previous night’s dinner are often mashed up and kneaded into dough to make parathas. The parathas are then eaten with pickles and/or yogurt for brunch or lunch the next day. I’m always in search of new and creative ways to get more lentils, a rich source of protein and iron, into our vegetarian diet. In this recipe, the split chickpea lentils, also known as channa dal, mix well into the dough, making the parathas much easier to roll than if they were made with vegetables or harder-texture lentils. Soft and tasty, these were devoured by the family in about 5 minutes flat! Rinse lentils. Combine lentils, water, salt, cayenne and turmeric in a large pot on high heat. Bring to a boil. The lentils will foam up as soon as they start to boil, so immediately reduce the heat to low to prevent the foam from spilling over the side of the pot. Partially cover the lentils with a lid and boil gently. As soon as the foam reduces, cover the pot completely and simmer lentils for about 1.5 to 2 hours, stirring every 20 minutes. When the lentils are completely soft and velvety, turn off the heat. Add 1 tbsp oil to a frying pan on medium heat and sauté onions for about 8 to 10 minutes, or until browned. Add jalapeño peppers and sauté for another minute. When lentils are fully cooked, stir in the onion-jalapeño mixture and cilantro (optional). Remove form the heat and let cool, uncovered. 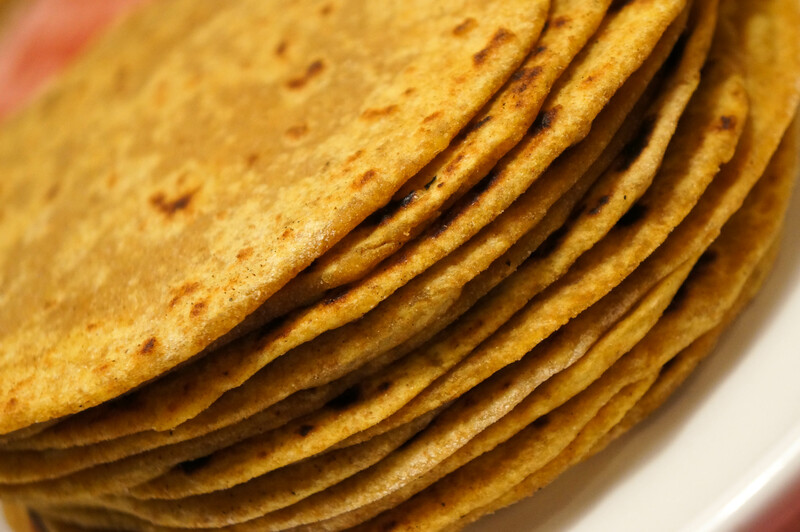 Once cooled, cover, and place in the refrigerator for at least 1 hour or until you are ready to make the parantas. Rinse lentils. Combine lentils, water, salt, cayenne, turmeric, onion, 1 tbsp oil and jalapeño in a pressure cooker pot. Seal the pressure cooker and place on stove with high heat. When the whistle first blows, reduce the heat to medium and continue cooking for 15 minutes. Remove from heat and allow pressure to fall and pin to drop. Open the pressure cooker and transfer the lentils to a bowl the cover. Allow to cool completely uncovered and then cover and place in the refrigerator for at least 1 hour or until you are ready to make the parathas. Combine 1 1/2 cups flour and lentil curry in a large mixing bowl. Mix well and knead until you have a ball of smooth dough without any clumps or flour in it. In the beginning this will be very sticky, but continue to mix and knead. If the dough continues to be too sticky, add 1/4 cup flour at a time and continue to knead until the dough is no longer sticky. Let rest, covered with plastic wrap, at room temperature for 30 minutes. The dough is then ready to use. When you are ready to start rolling out you parathas, heat the thava on medium-high heat (if you are using a frying pan, heat it on medium heat) for 5 to 7 minutes. Line a plate with a large piece of aluminum foil. This is where you will place the cooked parathas to keep them warm. Spread the 3/4 cup of flour for rolling on another large plate. Unwrap the dough and pull off enough to make a ball 2 1/2 inches in diameter. Dab the dough in a little flour. Using you hands, roll this dough into a smooth ball. If the dough sticks to your hands, rub 1/2 tsp oil on them. Once you have a smooth ball, roll it in the flour, cover it completely but lightly. With a rolling pin, roll out the ball until it is 3 to 4 inches in diameter. When the paratha starts sticking to your rolling pin, cover both sides once again with flour, completely but lightly. Roll out the paratha until it is about 6 to 8 inches in diameter (1/8 inch thick). Stack the cooked parathas on the foil, wrapping the material completely around them. This will keep them warm and soft. Will keep in the refrigerator for up to 2 days, well-wrapped in aluminum foil. Enjoy! Recipe adapted from “Elegant and Inspired, Vij’s Indian Cuisine,” Cookbook by Vikram Vij and Meeru Dhalwala. I love all types of parathas. This one looks absolutely delicious.